Personal Service, Understanding, and Confirmation. To be able to provide you with a web site that successfully portrays your business, we need to understand your business. During the web site design process we will liaise directly with you, ideally face to face, and discuss your requirements. Once you are happy we understand your business we will then discuss the web site design specifically. When considering the design we look at any printed materials, logo's or themes your business already uses. You've worked hard to develop a brand, this we appreciate so we want to carry that through to the internet. If you have no current logo or branding we can work on this with you to design a logo or brand complete with complimentary colour scheme. 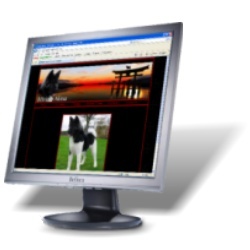 After this meeting we will mock up usually a few front pages of your potential site for you to choose from. If you feel our ideas need tweaking then following your suggestions they will get tweaked and resubmitted to you for approval. Once you have chosen and approved the mock up we will then get down to the business of designing the full site. So you can monitor progress we give each customer access to a design portal so they can see their site as it's progressing and suggest changes along the way. Once the site is complete and you are fully happy with it we will then make it live to the world. Our site design process keeps you 'in the loop' all along the way. You get the site you want or you don't pay. While we know the majority (around 85%) of users are looking at our sites with Internet Explorer there are still a wide number of user using other browsers. Different browsers display sites differently and even pictures look brighter or darker depending on if a site is viewed in Windows™, Linux , or a Mac™ operating system. Every site we design we test in a variety of web browsers and under different operating systems. This in general ensures our code that makes up web sites has a wide compatability range and the maximum number of users get to see your site how it's meant to be seen not how an individual computer interprets it.